Why the pro players boost their forehand Hurricane 3 heavily? The difference between the DHS Hurricane 3 commercial, provincial, national version? Comparison between the DHS H3 and the H3 Neo version? Or should I buy the DHS Hurricane 3 Blue Sponge or Orange sponge? I’ve explained some of these questions somewhere on this site. You can find all of these answers in How to Choose the Best Equipment. For example, if you want to know about the difference between the Blue Sponge, and Orange Sponge, just search “Blue Sponge PingSunday” on Google. And boom! You found it! If you hesitate to choose which version (commercial, national, or provincial) Hurricane 3 to buy, I recommend you read the article about the personal Ma Long’s Hurricane 3 rubber. Today, I will explain why top Chinese players tune their forehand rubber (Hurricane 3 Blue Sponge)? And where to buy the real DHS Hurricane 3 rubbers. Why do we need to tune Hurricane 3 rubber? Why are National Hurricane 3 rubbers boosted? Where to buy DHS Hurricane 3? What is the difference between the Blue sponge and Orange Sponge of Chinese Table Tennis Rubber? Blue Sponge is harder than the orange sponge. You will find that almost the top Chinese players use Hurricane 3 Blue Sponge. It’s just because the Hurricane 3 blue sponge version (more info) is harder than the Orange version (more info) (to +1 to 1.5 hardness degree DHS scale). All male Chinese players use Blue Sponge. Because male can hit very hard on the forehand side. Note: When you buy an Orange Hurricane 3 or Hurricane 3 Neo version (Old version). You need to use the faster blade! It depends on your style. If you play a lot of control, slow loop, you can play with Orange sponge or the old version of Hurricane 3 (non-NEO version). You need to hit harder to use Blue Sponge. It depends on your style and what blade you use. Orange Sponge needs a stiffer and harder blade. But nowadays, with the new poly ball, I recommend you choose the “Blue Sponge”. Which is harder, faster! The new ball is bigger, and heavier now. That’s why many top players changed from the old H3 to the new blue sponge version. And if you found it too hard, you can always “tune” it, or “boost” the rubber (like many top Chinese players do). Read more about Booster and Tuners for Chinese rubbers here. I have explained the different version of DHS Hurricane 3 rubbers here. Why top Chinese players, or all of the provincial and national Chinese players heavily tuned their rubbers? It’s the truth! No doubt! Here, for example, I will show you some evident proofs. Guide: How to tune Chinese rubbers with booster! Here is the equipment of the Chinese players at the recent Asian Games 2018 Table Tennis in Jakarta (shared by Hung Nguyen). Hurricane 3 on Forehand. Blade is Viscaria. Again, Viscaria and Hurricane 3 (Blue Sponge), a classic combo for Chinese player. Can you see something on these photos? On the Forehand side: All the Chinese rubbers use the Hurricane 3 Blue Sponge version. Hardness about 39-42 (DHS hardness scale). And they boosted the rubbers heavily. How to know that. The boosted rubber has the pimples stretched. The booster makes the rubber expand. So you can clearly see the “pimples” grow up! You can easily “see”, and “count” these pimples (because of the tuner). While the normal version, you can not see the pimples! Even on the backhand side, with the Butterfly Tenergy 05, they also boost it! Some players can switch to the softer version of Hurricane 3, and use it on the backhand side instead of the Tenergy 05. Let’s compared with the normal version (without booster). This is the normal version of Tenergy 05, used by Harimoto Tomokazu (Order it on Amazon). Read it here: What is Harimoto Tomokazu equipment? And this is the “tuned” version of the Tenergy 05, used by the Chinese player. The upper photo, you can not see well the pimple! The below photo, you can see that the pimples “expanding”! Pro players need to boost the Chinese Hurricane 3 rubber. Why don’t they just buy a softer version? Because boosting is a way to add the “tension” in the rubber. Japanese engineers have spent many years to build the high tension (Tenergy series) rubbers. But using tuners is the fastest way to “inject” the tension in every rubber (by the chemical way). Tension will make the Chinese rubber +10% faster, and +15% spinnier! A soft version of Chinese rubbers doesn’t have the “tension”. That’s the reason why top players prefer using harder version, and then tune to the desired hardness. For example, Ma Long will choose a very hard National DHS Hurricane 3, with 42 degree, and then tune it to the 40.5 to 41 DHS hardness scale. Buy on the local retailer (mostly shop in China, Hong Kong), or international retailer (online shop Worldwide). However, buying in these online shops, the quality of rubbers vary from batch to batch. And sometimes, you can get the fake rubbers. Because some retailer buys the cheap DHS rubbers from Taobao. Some local shops in Mainland China do not have the “online shop”. So some DHS versions are only available for Chinese, or for someone who can travel to China. Buy on the Official shop of Double Happiness. But unfortunately, the Online is shop is under construction, and the Shipping information is not clear. (Read below). Go to the international marketplace (like Amazon, eBay, or Aliexpress). And choose the DHS shop page. I think this is the safest way to buy DHS rubber. As there is only one DHS shop which is verified on these platforms. Buying on these platforms will reduce the risk of buying fake products. Some platform also offers free shipping to the US, the European countries (France, England, Spain, Germany, etc). The main advantages of buying on these platforms is: You can read the feedback (with photos) from many buyers around the world. Of course, if you want to buy a real, a legit product, you should go to the Official Double Happiness shop. However, there is so many version of DHS Online shop. Which one is real? And does they ship worldwide? I have contacted DHS Sale online about this, but until now, I got no answer. So where is a good place to buy good quality Hurricane 3 Blue sponge? I would say, you should say only in the official store in Shanghai and Beijing. Everything below 80 Dollars is fake. Hurricane 3 Neo blue sponge is a Chinese national team rubber. They don’t sell it outside. So, you get a lot of fake products normally. You can get the provincial blue sponge though. Else, better go for the commercial orange sponge and use a good booster. Here is the Beijing official DHS store opposite to the China National Ping Pang Training Center. Address: Beijing: LeeSheng Sports Mall. It is located in no. 201, Wangfujing Street, Dongcheng District, China. They don’t have an online shop. So it depends on you to choose the shop. Many customers in China have shopped in the local shop, or they go to Aliexpress. In general, the price on Aliexpress is cheaper than on Western retailers shops. Western retailers have imported the products from China, and by adding the tax, so the price is higher. The advantages of Aliexpress is, they can ship Worldwide. And sometimes I get the free shipping. Many players asked me where to buy the real, the original DHS National 3 (Blue Sponge version). This version is rare. Normally, they are reserved only for National Chinese players. You can read more about the Ma Long forehand rubber (National Blue sponge version) here. Here you can view and buy the National DHS Hurricane 3 on Aliexpress. Aliexpress is more known in the Asian market, while the European players prefer buying on Amazon, or eBay. Why Chinese players only use “Black color” on their forehand side? Read the explication here: Difference Between Red and Black Table Tennis Rubbers? This is the DHS Original BLUE SPONGE Provincial Hurricane 3 (Size:158*152mm). The Provincial Hurricane 3 is reserved for the top Provincial players in China (professional only). You can view the Provincial DHS Hurricane 3 (Old version) (Blue Sponge) here. And here is the Provincial DHS Hurricane 3 (Neo version) (Blue Sponge). The sponge is NO .22 sponge (Blue). Blue sponge is in general harder than the Orange Sponge. Hardness: There 3 hardness version: 39/40/41. Only the national players can have the customized hardness scale like 40.5, 41.5 and 42. They can tune it to soften the sponge a bit. Look carefully on the front packing, there is “Three Chinese Characters in Blue” in the “Round White Sticker” (at the right-down corner in the front packing), which is the difference from the normal provincial H3 orange sponge (from the packing). There are several sellers of the Provincial DHS Hurricane 3, you can select it from the list here. The main difference between the Provincial versus the Commercial version is the topsheet, not the sponge. Because the sponge (both Orange, and Blue version) are much cheaper than the topsheet. That’s the topsheet that make the characteristics of the Chinese rubbers. The pro’s version has a tackier topsheet. And the topsheet tackiness lasts longer. The hardness of the topsheet also will decide the first bounce speed to the ball. The pro version gives the faster ball. Some dealer said that: “The Provincial Hurricane 3 is cut in the middle of the big sheet. While the commercial one is cut at the side of the big sheet”. However, it’s not true! 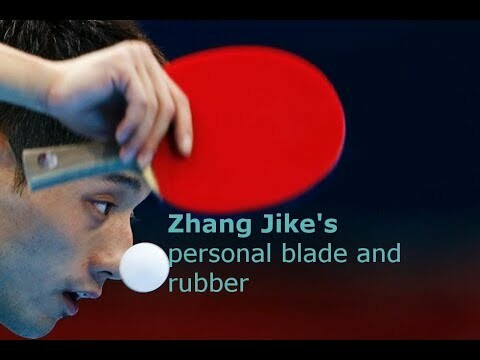 If you watch the video “How are table tennis rubber is produced”, you will understand it. There are no so-called big-sheet Chinese rubbers. If you are new to Chinese rubbers, I recommend you buy and test the Commercial version first (much cheaper, around 15$/rubber). You can order the DHS NEO Hurricane 3 (Commercial) 2.15mm 2.2mm on Aliexpress here (Rubber is also genuine as there is an authenticity code to check. Recommended). Commercial DHS Neo Hurricane 3 Orange sponge. Thickness 2.20mm, 39 hardness. Please share your own experiences of using Chinese table tennis rubbers below. thank you coach. I have used the provincial version and I like it. Coach, is tuning legal for tournament play? Hello Mark. No, it not legal. However, at the small tournament, no one will check your racket. Only at the international tournament, they can verify it. Firstly, just want to say thank you for providing such insights for us. I’ve been waiting for years for a person such yourself to really speak up about those subjects. It might seem common knowledge for the chinese, but for the rest of us it was just a very hidden area. Thanks and keep up the work! It seems like the foreigner (Western players) loves National, Pro versions. 😀 It’s a huge business. Chinese player just buys the normal domestic version, which is a little bit different from the worldwide shipping version. Hi coach! Thank you for the lot of useful informations. I have one question: can i use booster if the rubber is “NEO”? I read in a page that NEO means “factury tuned” and it’s a “pre-glued” form. I don’t know exactly what does it mean. The Neo version is the New – factory tuned Hurricane 3. However, the factory booster effect is weak! So you should also boost the NEO version. But if you want to boost, you should buy the “non NEO” the old version Hurricane 3. This version will absorb the booster slower, longer boosting effect than the NEO version. would you say NEO Hurricane 3 as sold on Aliexpress is good choice for recreational player? Or are hard Chinese rubbers not the best choice? And how come boosters are not available on Aliexpress? Which one would you recommend? Which forehand rubber would you recommand if you do NOT want to boost? Do you think that tabletennis11 is a good place to buy real chinese rubbers? Hello!! Do you have a recommended shop address in Shanghai where I can buy the rubber? Also I want to buy a Yinhe blade and dhs glue. Address: Beijing: LeeSheng Sports Mall. It is located in no. 201, Wangfujing Street, Dongcheng District. They don’t have an online shop.